We’d love your help. Let us know what’s wrong with this preview of Before Amen by Max Lucado. We all pray . . . some. We pray to stay sober, centered, or solvent. When the lump is deemed malignant. When the money runs out before the month does. When the marriage is falling apart. We pray. But wouldn’t we like to pray more? Better? Stronger? With more fire, faith, and fervency? Yet we have kids to feed, bills to pay, deadlines to meet. The calendar pounces on our good We all pray . . . some. Yet we have kids to feed, bills to pay, deadlines to meet. The calendar pounces on our good intentions like a tiger on a rabbit. And what about our checkered history with prayer? Uncertain words. Unmet expectations. Unanswered requests. We aren’t the first to struggle with prayer. The first followers of Jesus needed prayer guidance too. In fact, prayer is the only tutorial they ever requested. And Jesus gave them a prayer. Not a lecture on prayer. Not the doctrine of prayer. He gave them a quotable, repeatable, portable prayer. Couldn’t we use the same? To ask other readers questions about Before Amen, please sign up. Max Lucado's newest book, Before Amen, The Power of a Simple Prayer, is a "how to" book about prayer. For anyone who has ever wondered how to approach God in prayer or just simply how to pray, this book is for you. The book is small consisting of nine simple to read chapters. I loved the way Mr. Lucado started chapter one, "Hello my name is Max. I'm a recovering prayer wimp. I doze off when I pray. My thoughts zig, then zag, then zig again." I could have made that same statement entering 'Cindy' for Max. Let's be honest, I'm sure some of you out there start prying at bedtime and the next thing you know you are waking up and never said 'amen'. Or you're in church and the pastor is leading prayer and your mind zig's to what to fix for lunch or where you plan to go after church. I'm sure most of us have been there before. If you find this to be true for yourself, this book is for you. Mr. Lucado shares about the different types of prayer and how we should pray during the times that are the hardest. In the first chapter, he shares with the reader his "Pocket-size Prayer". This prayer is easy to remember and should help the person who feels they don't know how to pray get started. So many times I have heard people say, 'I don't know how to pray'. Believe me there are many people in the world that feel that way. Mr. Lucado explains, "God will teach you to pray." He also goes on to tell the reader, "Prayer is simply a heartfelt conversation between God and his child". I enjoy Max Lucado's writing. It is simple for the reader to understand. In fact, it's like he is sitting across the room talking with you. His explanations are clear and easily understood. I would highly recommend Before Amen to anyone who wants a clear picture of praying. I truly enjoyed this book. I would like to thank Litfuse Publicity and Thomas Nelson Publishers for my advanced reader's copy of Before Amen. I received my copy for free in order to read it and give my honest review, which I have done. In Before Amen The Power of A Simple Prayer, Max Lucado demystifies prayer. He suggests a basic outline that we can build our own prayers on using the example given by Christ himself (The Lord’s Prayer). It’s simple, it’s memorable, and it will be helpful for anyone who wants to pray better, deeper, and stronger. I wish this book would have been available to me when I first began to follow Christ. There was a time when putting my praises, fears, and questions into a prayer was intimidating. I did In Before Amen The Power of A Simple Prayer, Max Lucado demystifies prayer. He suggests a basic outline that we can build our own prayers on using the example given by Christ himself (The Lord’s Prayer). It’s simple, it’s memorable, and it will be helpful for anyone who wants to pray better, deeper, and stronger. I wish this book would have been available to me when I first began to follow Christ. There was a time when putting my praises, fears, and questions into a prayer was intimidating. I didn’t know how to pray or where to even begin. What if I messed it up, misspoke, or angered God? Max Lucado shares two things in this book that every new believer needs to know: Prayer is “a heartfelt conversation between God and his child” and even the disciples asked Jesus to teach them how to pray. This book serves as a practical lesson in prayer for all believers and is especially helpful for those of us who have never had prayer modeled to us. In the first chapter, Max shares a few examples of how prayer is used in scripture, what Jesus said about prayer, and God’s intended purpose for prayer. Then the author introduces The Pocket Prayer. The Pocket Prayer provides a scaffolding of sorts on which readers can begin to build their own conversations with God. In each subsequent chapter, he offers thought provoking stories and prayer prompts to guide readers in praying for themselves and others. Before Amen is concise--Max presents his ideas within the first 100 pages of the book. The remainder of the book is a study guide prepared by Jenna Lucado Bishop. It’s a valuable tool that prompts readers to personalize the narrative, reflect on passages of scripture, pray, and then be attuned to hear God’s reply. While I completed the study alone, I could see it being used effectively in a teen/college ministry, Sunday School, or new believer class. Max Lucado hits it out of the park once again with this excellent book on the topic of prayer! BEFORE AMEN arrived in the mail and my preacher/husband snagged it. I told him, I have to review this. You can have it as soon as I finish! He's like, when will that be? I said, it's due tomorrow. He was happy. Especially as his Wednesday night sermon topics are on prayer. Okay, people call me a "Prayer Warrior." I do pray. All the time. Nonstop. I pray as I go about my day. I have the Lord's Prayer memorized (and no, that is not what I pray all day long.) I wasn't real happy to see the prayer BEFORE AMEN arrived in the mail and my preacher/husband snagged it. I told him, I have to review this. You can have it as soon as I finish! He's like, when will that be? I said, it's due tomorrow. He was happy. Especially as his Wednesday night sermon topics are on prayer. Okay, people call me a "Prayer Warrior." I do pray. All the time. Nonstop. I pray as I go about my day. I have the Lord's Prayer memorized (and no, that is not what I pray all day long.) I wasn't real happy to see the prayer simplified. "God, you are good. I need help. They need help. Amen." Really? What kind of a relationship are you going to have with someone when you communicate like that? This isn't a text-message prayer we need to learn. This is real time, people! Max Lucado treats the whole topic of prayer, in my opinion, with a very cavalier attitude. Yes, God doesn't expect thees and thous. He wants a relationship. And again. If you communicated with your best friend like that, your relationship will go downhill fast. "Hi, BFF. You are good. I need help. They need help." Uh uh. Not good. I also (and again, this is my opinion, my husband disagrees) don't condone approaching the God of the Universe with a "Hi, Daddy!" He may be our Father in Heaven. He may be approachable, through Jesus. But He's not my daddy. He is my God. My Saviour. My Lord. To me, the "Daddy" reference to God really downplays who and what God is. If you do need help praying, this is a simple, easy to read, nonfiction book by acclaimed author Max Lucado. And he probably knows a lot more about the topic than I do. I was offered the book in exchange for my honest opinion. Max Lucado brings a fresh perspective filled with child-like faith to the study of prayer in his new book before amen. That's what struck me about the book. The way Max Lucado highlights the true father-child relationship of prayer. I read passages of this book to my husband because they so struck me. I also highlighted, underlined, and tweeted thoughts...not because they were so revolutionary. But because in their very simplicity, the concepts urge me to approach my Father God as a child. To cu Max Lucado brings a fresh perspective filled with child-like faith to the study of prayer in his new book before amen. That's what struck me about the book. The way Max Lucado highlights the true father-child relationship of prayer. I read passages of this book to my husband because they so struck me. I also highlighted, underlined, and tweeted thoughts...not because they were so revolutionary. But because in their very simplicity, the concepts urge me to approach my Father God as a child. To curl up in His lap and share my days and concerns. Prayer doesn't need to be complicated or pious. All that is needed is a heart ready for and seeking relationship. I am a Max Lucado fan. Always have been! I love to read his books because he speaks on a level that, no matter what, I can relate to. I enjoy his direct approach to teaching the reader what he wants to teach them. Most of all, I feel like if I were to meet Max on the street somewhere, he would be amazingly down-to-earth and real. What do I love about Before Amen? That it is down to earth, real, straightforward and for everyone. You do not have to be a believer to get the things he is I am a Max Lucado fan. Always have been! What do I love about Before Amen? That it is down to earth, real, straightforward and for everyone. You do not have to be a believer to get the things he is sharing, in fact this is a great book for a young Christian. This would help a young (age) or a new believer to really understand the point of praying and the simplicity of it. However, this book can help the more mature believer come back to the basics and be reminded that those wordy, lengthy, "holy" prayers are not really what the Lord delights in. He delights in real. Not fake. I would recommend this amazing book to anyone who is struggling in their prayer life and they are wanting to become closer to their Lord and Savior Jesus Christ. I liked how Max Lucado wrote in a way that was very practical and easy for readers to comprehend. I liked how he illustrated that when children talk to their father, they use simple language and they don’t have to use the most vocabulary words. I learned that prayer can be simple and it doesn’t have to be dramatic and I don’t have to pr I would recommend this amazing book to anyone who is struggling in their prayer life and they are wanting to become closer to their Lord and Savior Jesus Christ. I liked how Max Lucado wrote in a way that was very practical and easy for readers to comprehend. I liked how he illustrated that when children talk to their father, they use simple language and they don’t have to use the most vocabulary words. I learned that prayer can be simple and it doesn’t have to be dramatic and I don’t have to pray to impress God or anyone else. He wants me to pray what’s in my heart and in my mind. Max reminded readers to come to God like a little child and I think this is critical. This book personally couldn’t have been written in a better time because we all know the world is in chaos, fear is trying to overwhelm us, and trials are trying to overtake us. Prayer is the key to communicating with God and this book can be a huge benefit to you, if you take its message to heart! If you’re looking a book to help you in your prayer life, then read this one! I would recommend this to anyone looking for a great book on prayer, why we do it, and how to do it. Reading Max Lucado is like sitting down with a cheerful, encouraging Christian Grandpa. I hate to admit it, but sometimes I stick my nose up at Max Lucado because of his lack of theological depth; othertimes, however, I just need someone who is for me and for Jesus, and that is Max's sweet spot. This book on prayer is approachable and practical. And helpful! Good ol Max. Thanks for this book. QUICK HIT – In his endearing conversational style, self-confessed recovering prayer wimp Max Lucado leads us into a simple prayer that can have a revolutionary impact. That’s the Pocket Prayer. If you boil down all the prayers of Scripture, that’s what you get. All of these or one of these or some of these. Praise to the Father. Help for us. Help for others. Thanks to Father. In the name of QUICK HIT – In his endearing conversational style, self-confessed recovering prayer wimp Max Lucado leads us into a simple prayer that can have a revolutionary impact. That’s the Pocket Prayer. If you boil down all the prayers of Scripture, that’s what you get. All of these or one of these or some of these. Praise to the Father. Help for us. Help for others. Thanks to Father. In the name of the Son. Fill in whatever words you need, add whatever flair you want—but don’t be showy!—do whatever you have to, but that is the essence of every prayer. I’ve read a lot of books on prayer. E.M. Bounds classic series remains a favorite. J.I. Packer’s book on praying the Lord’s Prayer is excellent as well. M.X. Lucado’s* Before Amen is just as good, though totally different. A lot of prayer books focus on the high theology of prayer. And that’s okay. By that, I mean that they are written in an expectedly theological style, perhaps even emphasizing the mystical nature of communication with the Godhead. Those books have their places. But that’s not Before Amen. He begins with the simple term, “Father,” the defining title of prayer. It strips away the formality, the loquaciousness, the need for etiquette and ritual. Do you understand how amazing it is that you have unfettered intimate access to the God of the universe? He doesn’t require a system of petitions merely to get you on his schedule. He’s right there for you anytime, anywhere, for anything. The bulk of the book could be summarized with the words healing and forgiveness. Heal the temporal, the physical, the immediate; heal the eternal, the spiritual, the forever. Lucado combines thoughtful teaching with wonderful anecdotes—the Rebecca’s Miracle Book (you’ll have to read it to know more) had me sobbing in sorrow. Sorrow for her pain, sorrow for the fact that I am not yet more like her. Max’s daughter, Jeanna Lucado Bishop, closes the book out by crafting a wonderful study guide. In many ways—if I can be so bold—I enjoyed reading through this section more than the stuff Max wrote. The guide invites you to PRAY through each chapter: Personalize (how does this apply to you? ), Reflect (where do you see this principle in Scripture? ), Abide (spend time with God about this), and Yield (surrender to God over this). You can read this book one of two ways. You can read the first hundred pages—the book proper—and leave it at that. An hour or so conversation with a friend on prayer. Or you can dive deep into the study material and make this a recurring part of your everyday life. Whatever you choose, and I definitely recommend the latter, you’ll come out with a fresh and invigorating perspective on talking with your Father. *The Internet appears not to know what Rev. Lucado’s middle initial is. There is never a Luado book that I don't come away from refreshed and convicted at the same time. Eu am nevoie de ajutor. Ei au nevoie de ajutor. I think if you are looking for an introduction to prayer this book is really good at covering the basics. Prayer is a form of communication that we utilize subconsciously. Whether Christian, Buddhist, Hindu, or other, we all talk to something or someone greater than ourselves. Our audience might be God or the stars and the Earth, or the little angel and devil on our shoulder—whoever receives our prayers, we all know that a listener is better than the empty air of when we talk to ourselves. We need confirmation of our thoughts, affirmations of our feelings, and a listening ear during troubled times. Prayer is a form of communication that we utilize subconsciously. Whether Christian, Buddhist, Hindu, or other, we all talk to something or someone greater than ourselves. Our audience might be God or the stars and the Earth, or the little angel and devil on our shoulder—whoever receives our prayers, we all know that a listener is better than the empty air of when we talk to ourselves. We need confirmation of our thoughts, affirmations of our feelings, and a listening ear during troubled times. From the early days of Christianity, prayer has been intimidating because language in the early days of the church—and even from the days of Jesus’ missionary work with his disciples—used formalized words that the laypeople did not understand. This misbelief that prayer must be structured, comprehensive, and analytical prevents many people from praying regularly and having conversatios with our Heavenly Father. Sometimes, according to popular Christian author Max Lucado, Christians feel their prayers would be too informal; sometimes they feel that God would not care about their problems; sometimes the negative situations and influences take hold of Christians’ minds; and sometimes they don’t know what to say. Therefore, Lucado believes that the easiest approach to take is to not pray at all. But prayer is essential to a wholesome Christian life, so Lucado teaches in Before Amen: The Power of a Simple Prayer that Jesus’ original form and wording of prayer are all we need to have a fulfilling relationship with God. In nine chapters, Before Amen discusses elements of prayer, Scripture, and behavior that can assist Christians in comprehending the simplicity of conversation with God. Lucado emphasizes his Pocket Prayer, a quick verse that demonstrates God’s goodness, humans’ need for help, and gratitude for God’s mercy—all elements that he believes are the foundation of Christian faith. Rather than a generic formalized prayer that has little application to everyday life, the Pocket Prayer is a simple statement of faith and gratitude that is easy to say anytime, anywhere. Lucado has dominated the Christian non-fiction genre and mainstream market for many years; while Before Amen is the first book by the author that I have read, I can certainly see why his books continue to remain popular. Before Amen is quick and simple book that can be read in a few short hours. The reading level of the text is easy: short sentences, easy words, and small chapters. Lucado relies on humorous quips that help readers relate to the theological aspect of the book and emotional stories to draw out readers’ faith. However, with the limited number of pages in the book and the simplicity of the text, Before Amen lacks the depth needed to truly impact readers in meaningful way in regards to prayer life. Lucado supports his arguments with Scripture but does not truly analyze that text to persuade readers that his belief about prayer is correct. In addition, the beginnings of some of Before Amen’s chapter’s do not correlate with the theological discussion that follows. While I understand that Lucado’s writing style appeals to readers who like an approachable way to their faith, the structure and language of Before Amen do not entice me to read any more of the author’s books. Review copy was provided free of any obligation by St. Martin's Griffin. No monetary or any other form of compensation was received. This is a book that reads quickly, which is good when one feels the pressure of much yet to accomplish. The book Max Lucado writes and shares with us is filled with nuggets of wisdom learned and things he is still learning. Many may look at the author as one who knows so much; yet, even Max would tell you he is still learning and that we all should be as well. At the end of the book is a study guide for those who want to learn more, perhaps develop their prayer life more or for use in a small group. However you are led to utilize it remember Max is pointing you to the Savior. The book is not a step-by-step instructional book on how to pray, but more like understanding the heart of communicating with God. The only part I didn’t like was the many different versions used to quote Scripture even using the Message. Grab a good Bible version and dwell there, look up the verses the author shares and write what you hear God saying to you. The book will remind you that prayer doesn’t have to be complicated, full of fancy words or done for long periods of time. Prayer is a command we are given by God to bring ourselves to Him and all the weights we tend to carry around in this sinful world. Until we go home to be with Him, we need to know what He wants us to do, where to go and more importantly how to please Him. It was a nice read that did help reaffirm a bit of my faith, although it wasn't anything life-changing or ground-breaking like I'd hope--still, that's not the author's fault. I first found Max Lucado when I was looking through my cousin's books as a little kid: back then I didn't have novels at my elementary school library, I was too scared to go to the "big kids'" section in the public library, and my house was decidedly devoid of any books except a couple of cardboard, fuzzy, picture books meant for those just beginning to read. My cousin was ten years older than me and already in community college; among her stack of books was this thin, small, green book, with a drawing of Baby Jesus on it and a title that said "THE CHRISTMAS CHILD" (it's still sitting on my shelf today). I think I read it and liked it, but didn't understand it; I'd read it again and again later, throughout the years, and each time I understood more and more about it. So I like Max Lucado, and I guess I was expecting a lot from him in this book. I'm still going through a time where I'm not as strong in faith as I could be, and I was looking for things to strengthen it. It was a nice enough book that did provoke a little bit of thought, and I'm sure it's great for some other people, but I'm still looking for something...more. 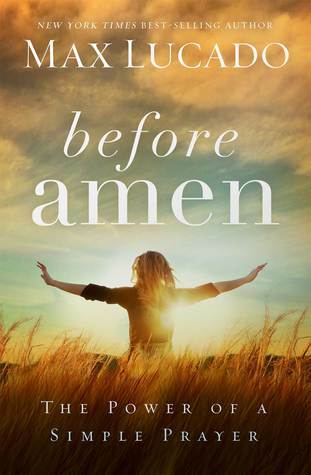 Before Amen is a book about learning to pray. We don’t have time to pray, we don’t know what to say, we don’t know how to say it, and we wonder if God really listens when we pray. While reading this book, it was like Max Lucado was in my living room talking to me as I read. What a book! I like to turn pages down, or highlight something to read again later. I would have highlighted the whole book. How do we address God when we pray? Father. That’s all we need. There are no secret words, no code words, just words from the heart. And you don’t even need to speak. God hears you. We all pray some, but to pray more, better, fire, faith, and fervency? Check out this book! Lucado does a great job breaking it all down and explaining how simple it really is. Believe God is who He is, trust Him with what you can’t handle, believe in His word, and watch God move. Does your world change when you pray? Do your circumstances, regrets, past, change because you pray? No, but you are surrounded by peace when you turn it over to God. He can handle it. Just talk to Him. He is in control and will keep you safe. Don’t worry about anything; instead, pray about everything; tell God your needs and don’t forget to thank him for his answers. If you do this you will experience God’s peace, which is far more wonderful than the human mind can understand. His peace will keep your thoughts and your hearts quiet and at rest as you trust in Christ Jesus. This verse says it all. God’s peace. For you. Talk to God today and feel Him near. I love this book for the simple yet straightforward way to prayer. I received this book free from Litfuse Publicity in exchange for an honest review. Max Lucado explains that praying is not reserved for special people or the ones considered “Prayer warriors,” yet prayer is for everyone whether a believer in God or not. When praying it is suggested to reveal all sin in detail no matter, what you consider is small or big, old or new, or “evil or insignificant.” Include in your prayer the need for forgiveness and ultimately your need for guidance to be lead in the right direction and to perform good deeds. A good discussion Mr. Lucado brings is the feeling of guilt people burden themselves with and do not have the knowledge on letting it go and giving it to God through prayer. Once you pray, you must learn to leave whatever you are confessing with God and not revisit it at anytime. Intercessory prayer is also powerful when praying to cover others than yourself as Jesus did while hanging on the cross praying for his enemies, “Father forgive them; for they know not what they do.” (Luke 23:23, KJV). If Jesus prayed for his enemies who crucified him then we can also pray for those who do not have good intentions towards us. Before Amen, The Power of a Single Prayer is a book encouraging you to pray for yourself and praying intercessory prayers for others leaving it with God and never to be thought of again. I recommend reading and sharing this book with friends, family, and using in study groups. I received this book free from Thomas Nelson publishing and the Litfuse reviewer program in exchange for an honest opinion in accordance with the Federal Trade Commission guidelines. My earliest memory of praying is when my aunt told me if I didn’t start praying bad things would happen to me. Another memory is when my mother would have me place my hand on her stomach and pray for her to conceive a child. I remember thinking… “Is this how this prayer thing works?” It wasn’t until I was eighteen years old that I understood the real power of prayer. Before Amen show readers that there is power in prayer. Prayer is simply a heartfelt conversation between GOD and his child (meani My earliest memory of praying is when my aunt told me if I didn’t start praying bad things would happen to me. Another memory is when my mother would have me place my hand on her stomach and pray for her to conceive a child. I remember thinking… “Is this how this prayer thing works?” It wasn’t until I was eighteen years old that I understood the real power of prayer. Before Amen show readers that there is power in prayer. Prayer is simply a heartfelt conversation between GOD and his child (meaning you). This book starts off with The Pocket Prayer. A short prayer whomthat you can write down and/or memorize it. I need help. Heal and forgive me. The author takes this prayer and breaks it down into individual chapters. In each chapter, the author tells the readers a story that shows an example of the power of a simple prayer. The chapter named “Thank You” was my favorite part of the book. The author listed in alphabetical order things he was thankful for. That chapter demonstrates to readers that there are so many things to be thankful for. Before Amen was an okay read for me. I don’t know if it’s a good or bad thing to say when it relates to a book dealing with the power of prayer. It wasn’t as in-depth as I thought it would be. There are so many spiritual books on the market today - so it’s important for each book to offer something new to readers. I believe in the power of prayer. I believe in a relationship with God and keeping the lines of communication open. Prayer is our way to talk to him and let our hearts be known. In Max Lucado's Before Amen, he explores prayer, it's power and it's simplicity, although we often make it more complicated than it is. Praying is intimidating to some people. They say they don't know how to pray. To others, like myself, they don't like praying out loud. Some people have grand words and seamlessly pray ou I believe in the power of prayer. I believe in a relationship with God and keeping the lines of communication open. Prayer is our way to talk to him and let our hearts be known. In Max Lucado's Before Amen, he explores prayer, it's power and it's simplicity, although we often make it more complicated than it is. Praying is intimidating to some people. They say they don't know how to pray. To others, like myself, they don't like praying out loud. Some people have grand words and seamlessly pray out loud and others are more simple in their words. God does not judge our prayers or our vocabulary. He just wants to hear from us. That about sums up the totality of what we pray for. We praise him, we pray for ourselves, we pray for others and we thank him. Lucado goes deeper into these areas and gives Biblical principals on prayer instead of relying on our preconceived notions. He doesn't ask us for long, glorious, elaborate prayers. He just wants to hear from us. When a friend calls you after a long time, aren't you just happy to hear from them? Do you judge what they say or how they say it? Of course not. Max Lucado? Book on prayer? Yes please! Before this book, I had heard of Max Lucado and read one of his Christmas books, but hadn't read much of his work. I have always been interested in prayer and using it to develop a closer relationship with God, so to see a book about prayer by the powerhouse author Max Lucado, and my attention was caught. It didn't disappoint. I am a baby on my religious journey, so something simple and direct was what I needed. It is what I got in this book. I wasn't fond Max Lucado? Book on prayer? Yes please! Before this book, I had heard of Max Lucado and read one of his Christmas books, but hadn't read much of his work. I have always been interested in prayer and using it to develop a closer relationship with God, so to see a book about prayer by the powerhouse author Max Lucado, and my attention was caught. It didn't disappoint. I am a baby on my religious journey, so something simple and direct was what I needed. It is what I got in this book. I wasn't fond of his thoughts on calling God "Daddy" and that prayer can "change God's mind", but his simple formula on how to structure prayer was a good guideline and the guide book at the end of the work really struck me. If you are a prayer warrior, this may not be the best book for you. It is more of a beginner's guide on how to get started on the journey of being a prayer warrior. It was a good fit for me at this time. I highly recommend this for the beginner prayer warrior and for those who are prayer warriors who want something to use to help others become prayer warriors too. Solid four star book. Most often I feel that I don’t pray enough, and at the times I do pray, I don’t think they are good enough. Before Amen was a reminder of how long prayers with sophisticated words are not necessary. Just “Oh Daddy!” is suffice. Prayer will always be the greatest weapon a believer could possess. With his very many illustrations and expounding on incidents from the Bible, Max has brought out the power of a simple prayer. It doesn’t have to be long or complicated, positions don’t matter, when you e Most often I feel that I don’t pray enough, and at the times I do pray, I don’t think they are good enough. Before Amen was a reminder of how long prayers with sophisticated words are not necessary. Just “Oh Daddy!” is suffice. Prayer will always be the greatest weapon a believer could possess. With his very many illustrations and expounding on incidents from the Bible, Max has brought out the power of a simple prayer. It doesn’t have to be long or complicated, positions don’t matter, when you even don’t know what to say, just these words will do. I always enjoy Max’s writing. Its concise, simple to comprehend, bundled with illustration and spurts with wit. His words are carefully chosen and intricately placed, and Before Amen is yet another feather on his hat! I started out 2015 reading Before Amen. It has been a great start for my reading as well as prayer life. i still need to work my way through the study guide in the back but I finished the main part of the book. loved it! highly recommend! Quickly read little book that packs a punch. When a very well-known author in the Christian publishing world starts a book with 'Hello, my name is Max. I'm a recovering prayer wimp. I doze off when I pray. ', I am instantly intrigued. I love Max Lucado's books. Have been reading them for over twenty years. They are the best Christian books in my opinion. Maybe because he's a fellow Texan! This is a short and simple book about the power of simple prayers. Max Lucado shows us how to pray based on the instruction given to us in God's word, the Bible. https:/ With more than 130 million products in print and several NYT bestsellers, Max Lucado is America's bestselling inspirational author. He serves the Oak Hills Church in San Antonio, Texas, where he lives with his wife, Denalyn, and their mischievous mutt, Andy. His next book is publishing August 2018 and is titled Unshakable Hope.